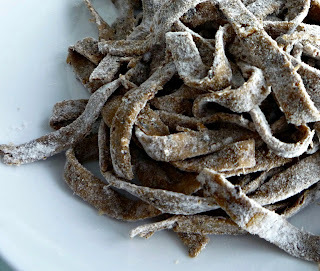 I got the idea for spent grain pasta here, but I used my veganized pasta recipe (2 cups semolina flour and 1/2 cup hot water) but replaced 1/2 a cup of the semolina flour with an 1/2 a cup of spent grain flour. The pasta could not be rolled as thing as it usually can due to the coarse grind of the spent grain flour. This pasta with no sauce leaves a strong, slightly bitter aftertaste but improves drastically when served with some tomato sauce. I think the taste of this pasta will depend a lot on the grains used in the brew. Overall this was a fun experiment, but I will keep looking for that perfect recipe to use up the majority of my spent grain flour. Has anyone else made spent grain pasta?